Monica Gawet, Owner and President of Tennessee Marble Company, has been chosen to represent the United States as an ambassador from the Natural Stone Institute’s Women in Stone on a trip to Germany to meet with the German counterpart from Meisterfrauen. The goals are to promote women in the stone industry world-wide and find areas to collaborate. Germany’s Stone+Tec conference in Nuremburg is hosting the second international Women in Stone meeting of this kind. Monica Gawet has been a leader in the stone industry for many years and a role model for many young professionals. Through our Mentorship Program, she worked closely with Magdalena Schoenwetter of JMS, a marble supplier in Germany. This relationship has given Monica a unique perspective and position to relate to the German stone industry. This connection, paired with Monica’s past leadership in the stone industry, made her the perfect choice to represent Women in Stone during this significant first meeting with Meisterfrauen. – Sarah Gregg, Women in Stone Administrator for the Natural Stone Institute. In East Tennessee we have become accustomed to women running companies, from the Knoxville City Mayor to many businesses across a wide spectrum of industries. Monica has staked her place as a trailblazer for women in the stone industry and is responsible for the survival of an iconic product made from a natural resource only found in a 200 mile stretch of land between Sweetwater and Rogersville, TN. Tennessee Marble, abundant, durable, and beautiful, was discovered in the 1800s, and became so prominent throughout the USA, that Knoxville became known as the “Marble City”. 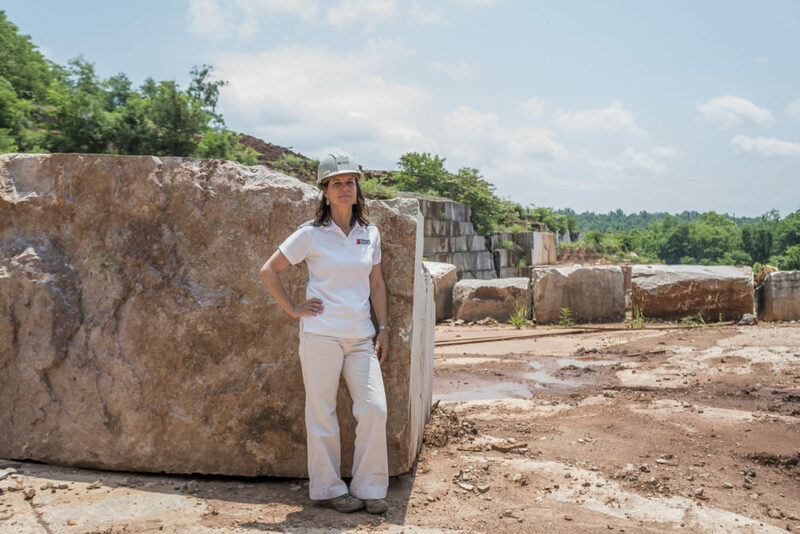 Monica has dedicated the past 25 years to Tennessee Marble, including the renowned Tennessee Pink , and for the past ten years, has been the only operator of the last of these quarries, Brown, Endsley, and Gray Knox quarries. She continues to send cut stone products around the country for use in notable buildings and monuments from coast to coast. Being a woman in the stone industry is rare, but especially a quarry and fabrication plant owner and operator, being one of only a handful in the world, something Monica does not take lightly. Monica has a rich heritage in U.S. Marble. Her grandfather immigrated to the US at age 18, found his way to Vermont and began working in a marble fabrication plant. Eventually he would open his own small fabrication shop, Gawet Marble, where her father later took over, and her brother now manages. She did not envision a career working with marble. She left Vermont to study finance at College in NYC. There, Tennessee Pink Marble was all around her at Grand Central Terminal, the NYC Library lions – Patience and Fortitude, and many other buildings, yet never did she imagine that one day she would be holding the reins on the cultivation and production of that stone, continuing her family’s marble work. She studied finance and worked in the private sector in NYC after college before taking a job with the Department of the Treasury and moving to San Francisco where she met her husband, Gus Zacharias. When the opportunity for purchasing quarry property in Blount County, TN, Monica felt the calling and made a huge leap of faith. With the purchase of the quarry and fabrication facility, Monica and Gus moved to Maryville in 1993. Shortly after founding the Tennessee Marble Company, and with no experience managing a quarry, Monica and Gus found out they were expecting their first child. There were no shortages of challenges in those early days, but, perhaps the largest came in after two years of operation. No stone was quarried for those first two years because there were already enough cultivated blocks on site and much of what they were processing was from other domestic stone quarries. They received their first large order for Tennessee Pink Marble in 1995, which meant they would have to quarry their first blocks. The project had the full public eye as it was to complete the East Staircase at Grand Central Terminal in NYC. Fortunately, the Brown Quarry site, which Monica was operating, was the same quarry used in 1910 for the original tile and stair treads inside GCT, and Monica was able to find quarry-men that had worked the quarry previously still in the area and available to go to work. The project was a success and Tennessee Marble Company has been quarrying ever since, now operating three quarries in Tennessee and one in Vermont. After 25 years in Blount County and having just watched the final of her three sons graduate from Maryville High School, Monica is not slowing down. She is on site, in her rubber wellies, buzzing around the office, fabrication plant, and out in the mud at the quarry making sure all is running smoothly. She calls herself a micro-manager, but really, it seems, it’s the relationships with her staff that seem to drive her. It is her sincere and genuine desire to know her craftsmen/women, quarrymen/women, and administrative team, and to see them grow and prosper professionally, overcoming challenges, and learning, that gives her satisfaction. She puts her family first, and next to that, it is evident, is her team at Tennessee Marble Company. Monica has been an active member of the Natural Stone Institute since its inception, born out of the merge between the Marble Institute of America, where she served as Board President, and the Building Stone Institute. With representation in 50 countries across the globe, the Natural Stone Institute offers training, professional development, advocacy, networking events, two publications, and is the authoritative source for safety and technical standards and information regarding the use of natural stone. Powered by the Natural Stone Institute, Women in Stone was established to recruit, retain, and advance women in the stone industry. With women participation in the stone industry growing as owners, sales reps, interior designers, fabricators, distributors, and quarriers, the necessity of such a group for networking, professional development, and leadership is vital. They also offer mentorship opportunities and celebrate individual achievement through the Pioneer Awards and Empowerment Scholarships. For more information please contact Josh Buchanan, josh@tnmarble.com, 865.995.9500.